A cocktail party has an established sense of importance in an adult’s life. Cocktail parties involve social networking; a party thrown by a company where employees can get together, or sometimes held after wedding receptions. What’s important to note here is that being social is key. But that begs the question, what if you run into a problem where someone can’t drink? Perhaps someone is pregnant or you’re in charge of an event for underage teenagers who aren’t allowed to drink. Mocktail parties can hold the same effect and entertainment as a classic cocktail party would. The only thing that isn’t involved is alcohol. Unlike a normal cocktail party where you would hold it later in the evening, hosting a mocktail party would typically call for beginning in the early afternoon and ending two or three hours later. You’d want to do this because this is a time of day when people aren’t usually expecting to drink. Choosing an event that coincides with a mocktail party is also a huge step to having a successful gathering. If it’s your first time hosting a party like this, starting off from home will allow an easier transition into planning bigger events in the future. 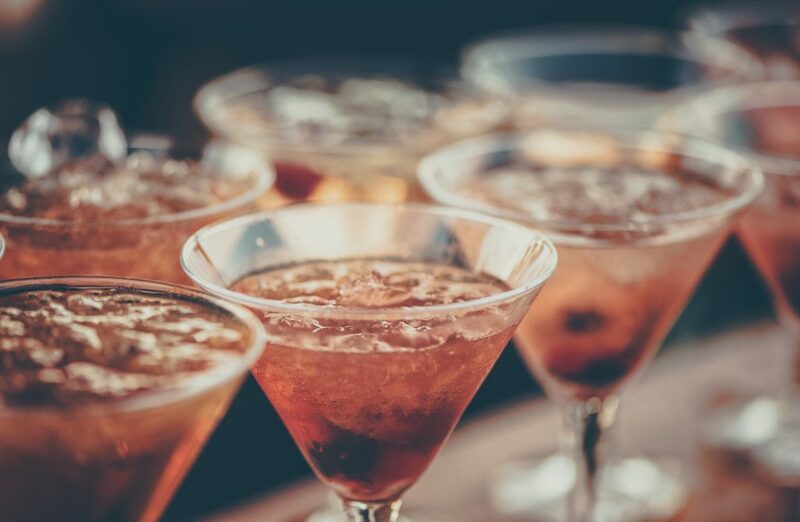 The key factor in throwing either a cocktail party or a mocktail party is having good quality recipes that people will enjoy. This is where you can get creative and try whatever you would like. You need fresh fruit juices, carbonated beverages (lemon-lime sodas, ginger ale, seltzer water, etc. ), decorative garnishes, ice, and an assortment of cocktail glasses. Orange juice, cranberry juice, and lime juices are some of the most popular mocktail juice bases as you begin your delicious drink. A cranberry-peach drink, which includes peach syrup, is an enticing tropical blend that is sure to be a hit. A bubbly Shirley Ginger is a pleasant drink that’ll have your taste buds dancing. You can even try a Lavender Lemonade which is surely something unique your guests will love. Dealing with seasonal fruits will also set the mood. If it’s the holiday season, be sure to create drinks that involve apples and cinnamon, peppermint, and hot chocolates. If it’s near the spring and summer seasons, you can’t go wrong with an ice-cold beverage with strawberries or oranges to refresh your guests! Some fair tips and warnings so you don’t make the mistake of running low on essential items is to make sure you are stocked up on all materials, specifically ice. You can use ice cubes, but crushed ice works best. If you only have ice cubes, do not worry. Place the ice in a bag and place a towel over it, then use a small hammer to crush the ice. As I stated earlier, being social is key to mocktail and cocktail parties alike. At these get-togethers, good food and good music is what helps to relax and motivate people into having a good time. Serve simple dishes like finger sandwiches, baked goods that you can make a lot of at one time (brownies, cookies, cupcakes for example), or foods you can make into miniature bite-sized pieces, like mini corndogs. A delectable cheese assortment is also a fantastic way to appeal to those with a more mature taste palette. Add in games for more added entertainment. You want to shoot for a game that is simple enough to understand, but not too boring. Trivia games are always a smash when it comes to a lively game. Charades, Pictionionary, Mafia, and Head’s Up are all party games that’ll brighten the room almost instantly with laughter and joy throughout the party. Going through this again, you want to remember these fundamental tips. Cherries, lime wedges, mints, etc. Remember that mocktail parties are here to include all age groups to have a good time. You can explore the fun in crafting together tasty drinks. Enjoy your very own DIY mocktail party and see for yourself how amazing it can be!